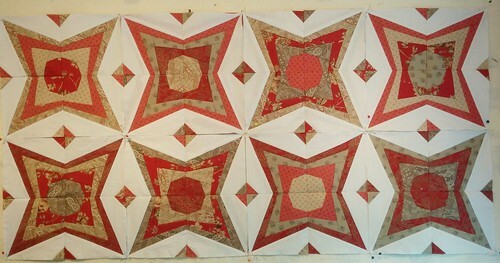 Back in 2010, I fell in love with the dusty, soft reds and tans of French General's "Rouenneries" line, and picked up enough fabric to make a full quilt out of it, including the coordinating extra-wide backing fabric. Then, of course, 2010 ended on something other than -- shall we say -- a planned note, and the fabric stayed in a drawer for a number of years. I tinkered with it a little, but the idea didn't come to fruition, so I put my failed attempt back in the drawer with the rest of the fabric, and eventually the drawer, along with my other belongings, came to Portland. Noah moved in with me in late 2015, and the whirlwind of New Life Together began to calm down a bit after the first year. Boxes got unpacked. Cats got over their snits. The dining room became a study. We bought sheets together. Learning to be newly married at 40, with baggage and scars and calendar anniversaries that aren't cakewalks, is very different from being a newlywed at 21. Early in 2017, I sat down with an oversized set of sticky notes and assessed the state of the state. In each of my travels between 2011-2016, I'd picked up fabric and yarn; at first just for souvenirs and later with a growing realization that there was going to be a 'later,' probably with far skinnier finances, where I might well be alone and grateful to have projects waiting on me. 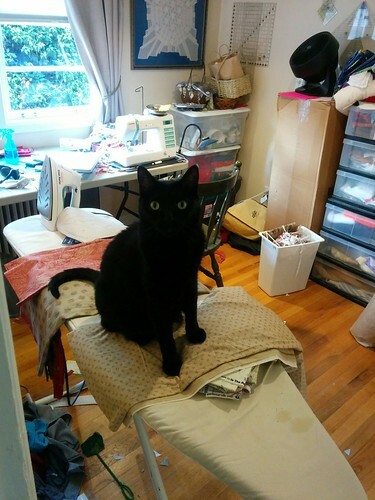 I could see evidence of projects waiting to be tackled: a second box of yarn, a few drawers in the sewing room filled with intended projects, ideas I hadn't found time to make. I decided that once I finished the five-year saga of Seven Brides, it was time to get to work. Sewn about 8-10 skirts. I'd have to go count. The list of items was so large it had to split into three sections: knitting, garment sewing, and quilting. 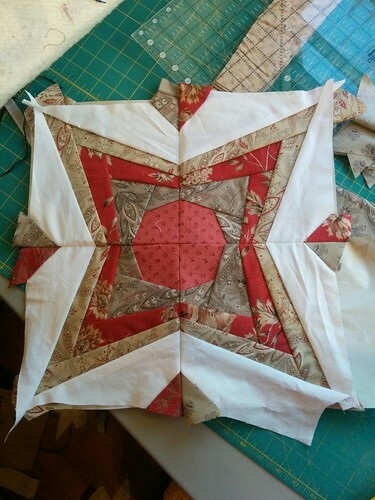 Once I ran down some of the long-standing items in the garment sewing and knitting columns, I felt I could tackle some more quilts. As "Circumvention" finished up I had that joyful moment of realization: I had both 1) a pattern that needed fabric and 2) fabric that was seeking a good pattern. Perhaps it was time to move French Letters off of the someday-list and onto the now-list. 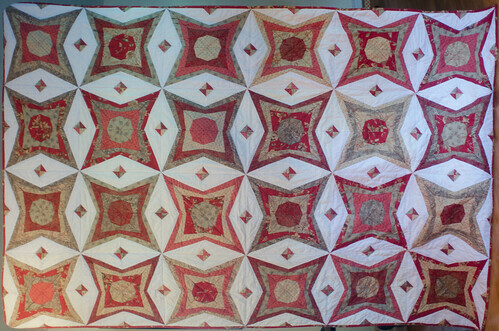 I bought Sam Hunter's Star Stuff pattern because it was gorgeous and didn't look like anything else in the market. (Amusingly, we're acquainted now; she's a Portlander too and this town's not as big as it looks!) 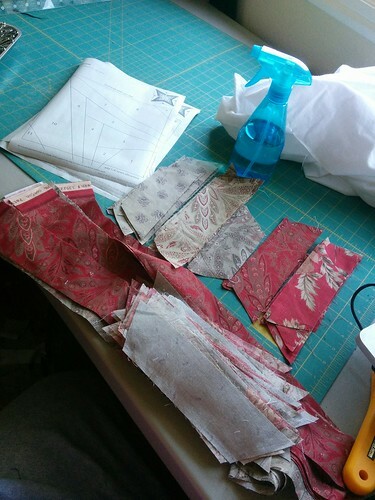 I compared the measurements to the strips I'd cut when trying out something before, and realized I'd gotten lucky: for several parts of the pattern, the strips were the same size. I could disassemble the failed attempt, press all the pieces, and recycle every single one of them into a new pattern. Perhaps we shouldn't eat her. I still have the Known Projects list; it's in my lap as I update this post, but seeing it with items scratched off is comforting.